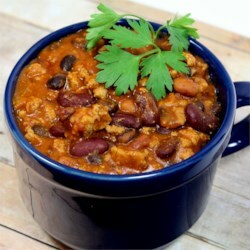 This is a great base for a slow cooker turkey chili. If you omit the red pepper flakes and replace one can of the tomato soup with a can of tomatoes with green chilis, this recipe is VERY kid friendly. When I want a more spicy version (I love spicy food! ), I only add between 1/4 and 1/2 teaspoons of the red pepper flakes. An entire teaspoon simmering all day in a slow cooker will blow out your sinuses! In addition to the black beans, I also used both dark and light red kidney beans to make it more festive. This recipe is a keeper in my recipe box. Thanks!